We left Lake Louise under cloudy skies at around 9:30 am this morning. After a quick stop to take on a bit of water, we were on our way. The first thing we saw was lots of runners doing the Banff/Jasper relay. That brought back lots of memories of when I did it with an RCMP team from Depot back in 1996. Back then we ran 24 hrs straight. Today’s run looks like it started at 7 am and ended at 9 pm, so it must be held over several days. Our weather improved steadily as we drove north towards Jasper with blue sky peaking out more and more as went along. Of course we had to stop at most lookouts for a few photo ops of all the oohs and aahs we were seeing as we went along. 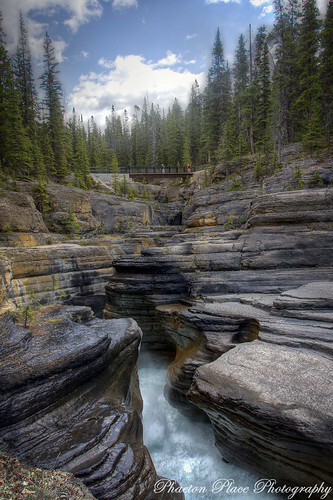 One of our favorite stops was at Mistaya Canyon where we hiked down to see the Mistaya river bash it’s way through rock formations on it’s way to the North Saskatchewan river. Simply amazing! 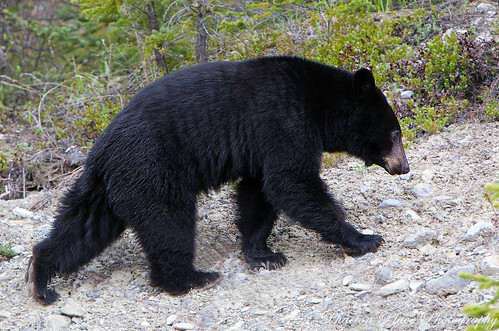 We did get to see a black bear today. It was very unassuming, just grazing on some grass on the side of the road. I grabbed a few shots with my telephoto lens and kind of like the way this one turned out. I was hoping for more of a facial shot but you have to settle for what the creatures decide to offer in the way of photo ops. This little fella was about 30 yds away, so not too bad. Without a doubt, the best part of our day was our visit to the Columbia Icefields. I had stopped here with my parents and family back in 1995 and was amazed at how far back the toe of the glacier has receded since then. 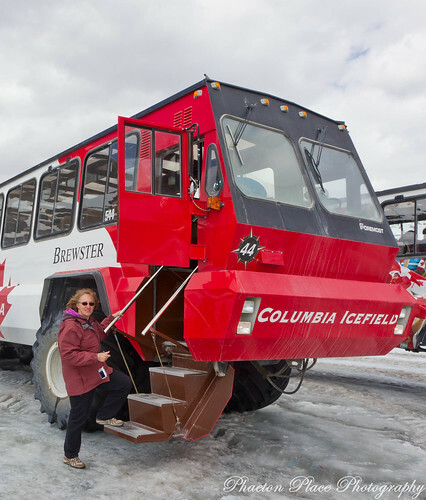 We took the snow coach tour on to the glacier. Tickets for the two hour trip were $50 each and definitely worth the money. I’ve got lots of photos to sift through but thought these ones for today should make it on to the blog first. We enjoyed an early supper at the cafeteria inside the Columbia Icefield Center after our trip on to the glacier. We are spending the night in the Center’s parking lot with half a dozen other motorhomes. The cost to boondock is $15.70 paid at an unmanned kiosk on the parking lot. We thought it was a pretty good deal for one night. We have a great view out our front window and have the hockey playoffs on satellite tonight. Go Canucks! We head for Jasper tomorrow morning. We’ll take a little hike to the toe of the glacier opposite the lodge before we go though. Chris’s daughter is bussing in to meet up with us in Jasper tomorrow night and will bunk in with us for a few days before we all head for Leduc next week. FYI, all today’s photos are on Flickr instead of Smugmug. 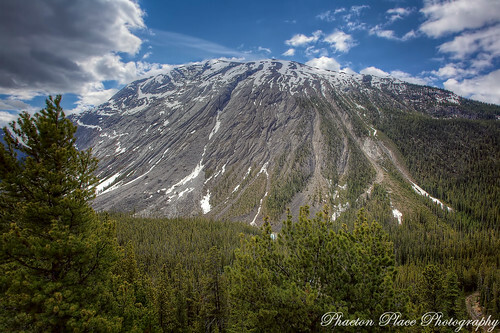 This entry was posted in Alberta, banff, jasper, Photography, sightseeing. OH THE MEMORIES!! We stopped along the Icefields to wander down where a Moose was grazing in the lake..and locked our keys in our pick up truck. McGuyver had to use his pocket knife to pry the back window open so he could reach in and get the keys..LOL! 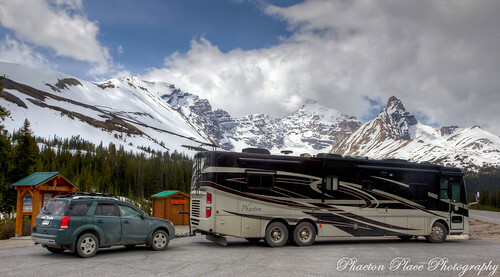 We stayed in a log cabin in Jasper..Your pictures are great…We are hitching a ride with you to Jasper! Good to know that the VisCtr allows overnighting … with all that the Parkway has to offer I can't imagine getting through it in one day. We have never been to the Icefields but Mike's parents have and they just loved it! 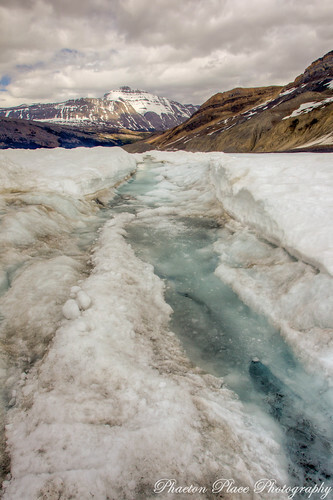 The Columbia Icefields are definitely on our "to see" list. Beautiful bear! What magnificent creatures!